Thus begins Trinity Sunday, the Sunday after Pentecost. Trinity Sunday celebrates the nature of the triune God, mission, identity, and purpose that we share through baptism. Trinity Sunday is one of the most difficult concepts to quantify, qualify, and explain. I've included a comic that humorously shows the three-fold thought process for the new preacher. 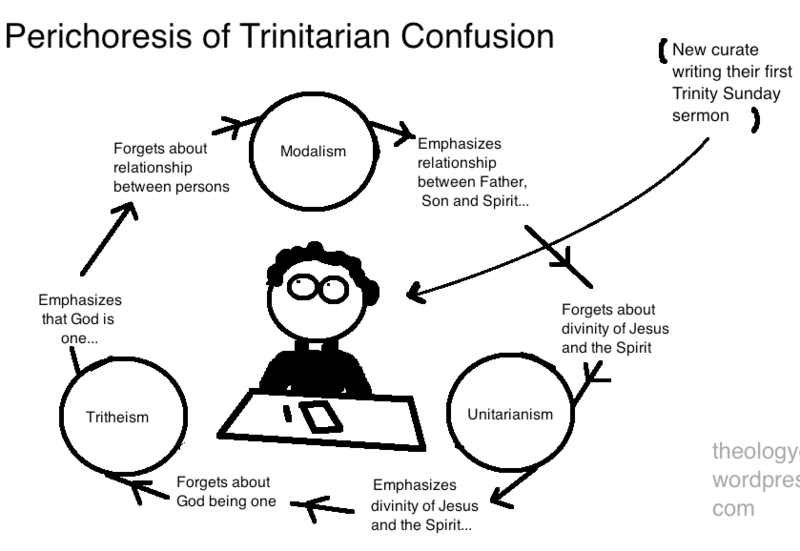 Whenever I think of the Trinity, the first image that comes to mind was from an after-school Christian Education class I participated in as an elementary student. The pastor took a handheld helicopter spinner toy that had three blades, all different colors. When he spun the toy slowly, we could see the three blades, each distinct. When he spun the toy faster, the blades made an iridescent shimmer. I remember thinking at the time that it was a good starting analogy, but I was curious for more. Well, I am still curious for more, and I don't think it will ever stop.